No one wants to see mold growing in their home. Mold is unsightly. It can damage your foundation, and it can wreak havoc on the health of your household. But for all the negative effects of mold, there are several exaggerated and even completely false beliefs that should be pointed out. The professionals at RestoPros, the most trusted mold remediation company in Dallas, have collected five of the most common myths about residential mold. Read the facts below and educate yourself before attempting to clean or diagnose a mold outbreak in your home. There are over 20,000 different species of “black mold,” which is technically not even a scientific term. Black is simply the color of certain strains – and one of the least common colors of fungal growth. Stachybotrys, which is considered to be the most toxic strain of mold, can be any color depending on the surroundings. In most cases this toxic mold is a greenish-black color, but attempting to identify it by the color is futile. Aside from testing the mold directly, the only sure test for the toxicity of a mold in your home is a direct allergic reaction. Bleach is the go-to product many people use to clean a mold outbreak. While it works well enough to “clean” mold off of a non-porous surface, bleach can irritate the skin and the fumes are dangerous if inhaled. Bleach is also not an ideal cleaner for porous surfaces – and can exacerbate the situation by seeping into wood, plasterboard, wall paper and other materials. Hydrogen peroxide and white vinegar are both preferred mold cleaners for mold growth on both porous and non-porous surfaces. This is partly true, but not all mold will make you sick. In most cases, the person is suffering from an allergic reaction to the mold. The “toxic mold” mentioned above, which is rare, can cause all sorts of respiratory problems, chronic fatigue, eye irritation and rashes among other symptoms. Toxic mold can make you sick, while most common mold outbreaks are more likely to trigger allergy symptoms. Mold allergies can include sneezing, itching, running nose and throat irritation; basic allergy symptoms generally associated with seasonal allergies. If you notice mold anywhere in your home, you need to clean it immediately. Even a small amount can do damage to the surface area and will continue to spread. Sometimes mold will grow in an area that was left damp (usually places in the kitchen or bathroom). But mold on the ceiling or a wall might indicate a separate problem that also needs to be dealt with. Roof and plumbing leaks are major causes of mold – and until they are fixed, the growth with only return if cleaned. If you are experiencing a serous mold outbreak, do not attempt to clean and eradicate the growth on your own. 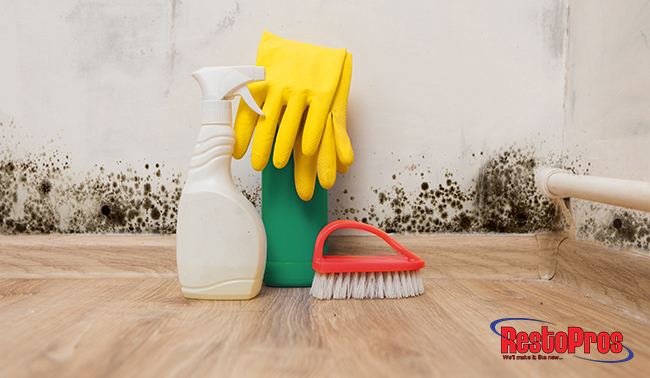 Mold that is the result of serious flooding or a major leak needs the attention of a professional remediation company. Mold can be an insidious intruder. It can ruin homes and greatly compromise the health and happiness of a household. Never attempt a DIY fix when dealing with a mold infestation. Trained experts can offer a full assessment (including diagnosing the root of the problem) and will have the latest equipment to deal with the growth. Experienced mold remediation technicians can also help file insurance claims to help cover the cost of the damages. Now that you have a clearer understanding of these common “mold myths,” you can be better prepared to deal with an infestation. While the mere sight of mold in your home should not be cause for alarm, it is important that it is dealt with right away. If you discover widespread growth, do not hesitate to call the professionals at RestoPros. We can send someone out to assess the problem and offer solutions for all aspects of the problem. Call us at 855-587-3786 to schedule an appointment today!